Porter ejects Gardenhire after warnings. warnings. 3B Umpire Hunter Wendelstedt issued warnings yesterday after a Royals-Twins inside fastball following a home run. Replays indicate the pitch was located inside and hit Maxwell who slammed his bat with force and stared in Deduno's direction before being escorted to first base by 1B Umpire Greg Gibson, the call was irrecusable. At the time of the ejection, the contest was tied, 0-0. The Royals ultimately won the contest, 3-1. This is Alan Porter (64)'s fourth ejection of 2013. Alan Porter now has 2 points in the UEFL (0 + 2 + 0 = 2). Crew Chief Jerry Layne now has 11 points in the UEFL's Crew Division (10 + 1 Irrecusable Call = 11). This is the 150th ejection of 2013 MLB season. This is the 72nd Manager ejection of 2013. This is the Twins' 4th ejection of 2013, 4th in the AL Central (DET 8; CLE 6; CWS 5; MIN 4; KC 3). This is Ron Gardenhire's 4th ejection of 2013 and first since July 13 (Vic Carapazza; QOC = Correct). This is Alan Porter's first ejection since August 2, 2013 (Mark Ellis, Don Mattingly; QOC = Incorrect). Haven't seen the video, but this sounds like the perfect place to issue warnings. What people, and including this "analyst" of MLB.com's don't understand is that the rule allows umpires to issue warnings at any time they deem it is appropriate, not just when it's a situation of intentional bean balls. Analyst gets the first part right, I think Porter takes Maxwell's reaction into account - yes, he is "livid" and clearly unhappy with what he thinks was a cheap shot. It likely wasn't. But the errant description is what follows. Porter issues warnings that any further intentional bean ball as retaliation or otherwise will be punished. It doesn't mean the pitch that hit Maxwell was an intentional shot, I don't think it was. It just means that Porter doesn't want a bean ball war. How is Gardenhire still the manager of the twins? He should of been fired a long time ago. I think Porter handled this just fine. 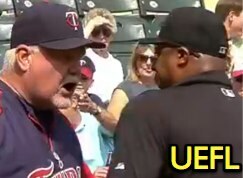 Can someone enlighten me: Why is Gardenhire pissed that Porter gave warnings? If KC retaliated, then their pitcher, along with Yost would be tossed. How exactly does this warning *hurt* Gardenhire's team? For that reason, he deserved to be ran. The way I see it: Porter warned both sides because of the potential conflict that could occur as Maxwell wasn't taking first without a little "show". That's what I see the warning being in response to. Not the pitch. I was thinking the same thing. Porter was protecting Gardy's team from retaliation. Why is he upset? Oh, wait... I just looked at the AL Central standings. The warnings stemmed from 1) The recent history between these clubs 2) The staredown from Maxwell 3) The unknown words that were thrown toward Maxwell from pitcher & catcher. If this is intentional, the umpire has two options to manage it. 1) Throw out the pitcher for intentional HBP, follow up with warnings; or 2) let the Royals have their payback, then issue warnings. I think we've seen both of these strategies work well for umpires in the past, as long as the pitchers aren't too blatantly obvious with their intent. But this isn't intentional, therefore, the warnings were issued strictly because it was not intentional and didn't warrant any ejection nor retaliation. As far as I can determine: April 20th, 2012. Thanks man its so neat to see this stuff as you don't see much in mlb. I like moe cause the announcers are such douches. But the one up there not to terrible either. I had made a call in babe ruth game where a batter lean into the pitch called ball 1 dead ball and didn't award first base. I think it's because it's Bob Davidson. At the time, he didn't have a great reputation. He's a bit more under the radar now. People just didn't like him then as you can hear with the announcers. According to the bench coach in the wrap, Gardenhire was upset that the warning made his pitcher scared to throw inside for fear of getting tossed. At least he had a reason when going out there. On another semi-related note, I wonder if the new system next year will allow the umpires to view replays of bench clearing incidents so that they can eject all involved instead of the one or two sneaky players escaping the axe? This crew really with a lot of ejections lately. I saw Paul Schreiber call it like 10 years ago when the hitter threw his big elbow pad up in front of a curve ball. The problem at the professional level is that all you have time to do is flinch most of the time.